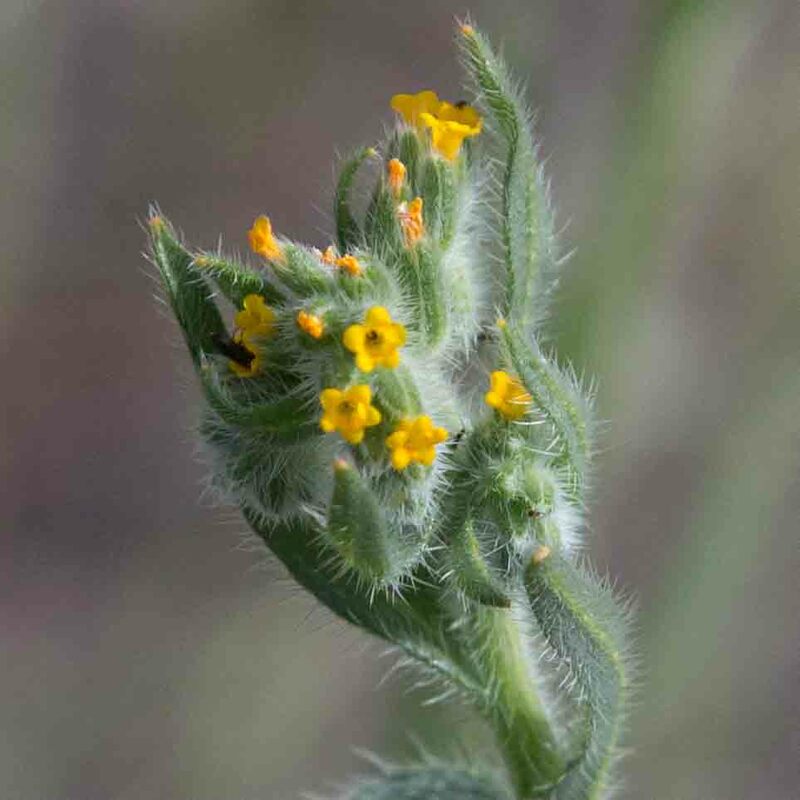 Almost all members of the Borage family have flowers in “scorpioid cymes”, starting as a tight coil (like a scorpion’s tail) and uncoiling as new flowers mature. 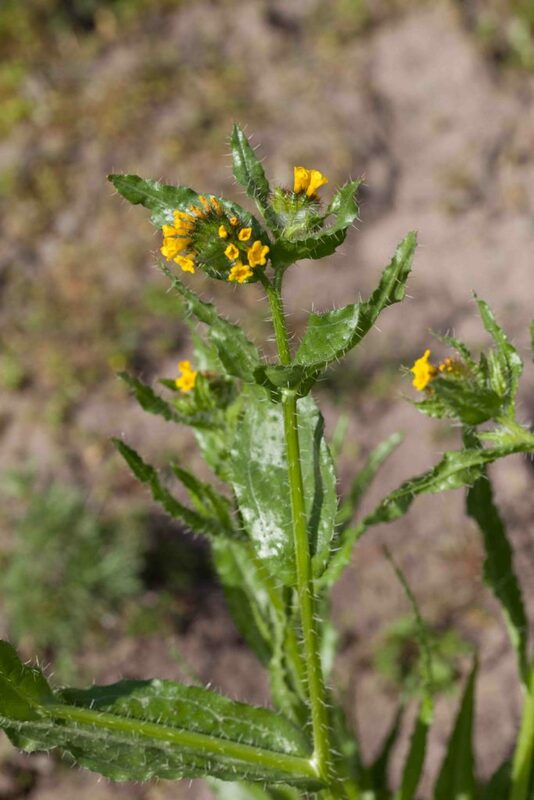 Fiddlenecks are a classic illustration of this, the name deriving from the shape of the top of a violin or fiddle – not to be confused with Fiddleheads which are immature fern fronds. 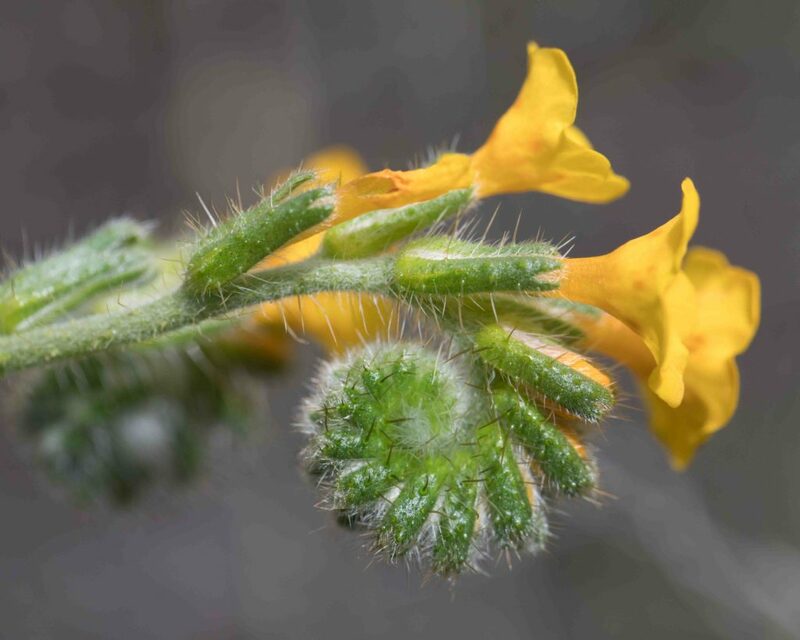 Fiddlenecks fall into two broad categories, those with 2–4 calyx lobes, unequal in width and those with 5 calyx lobes of equal width. 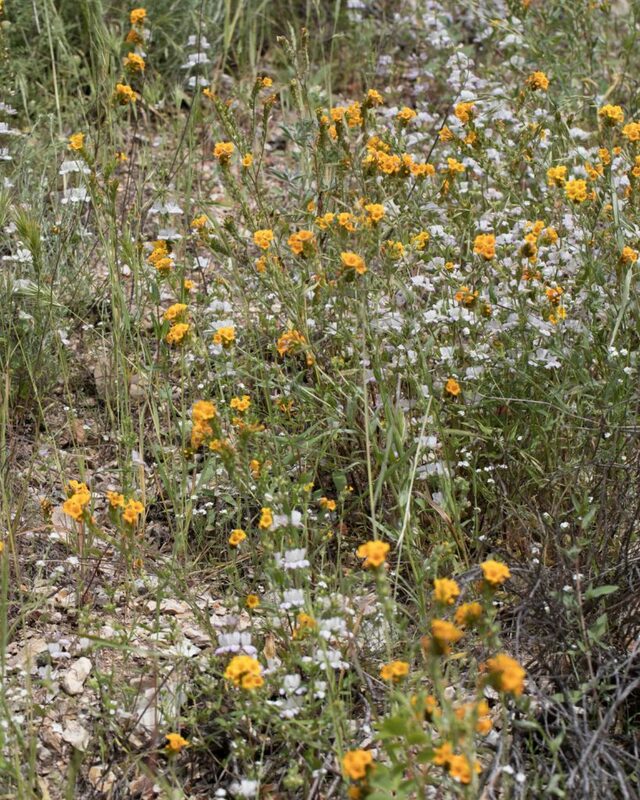 Careful examination is usually needed to identify the different species, they are difficult if not impossible to identify from a distance. 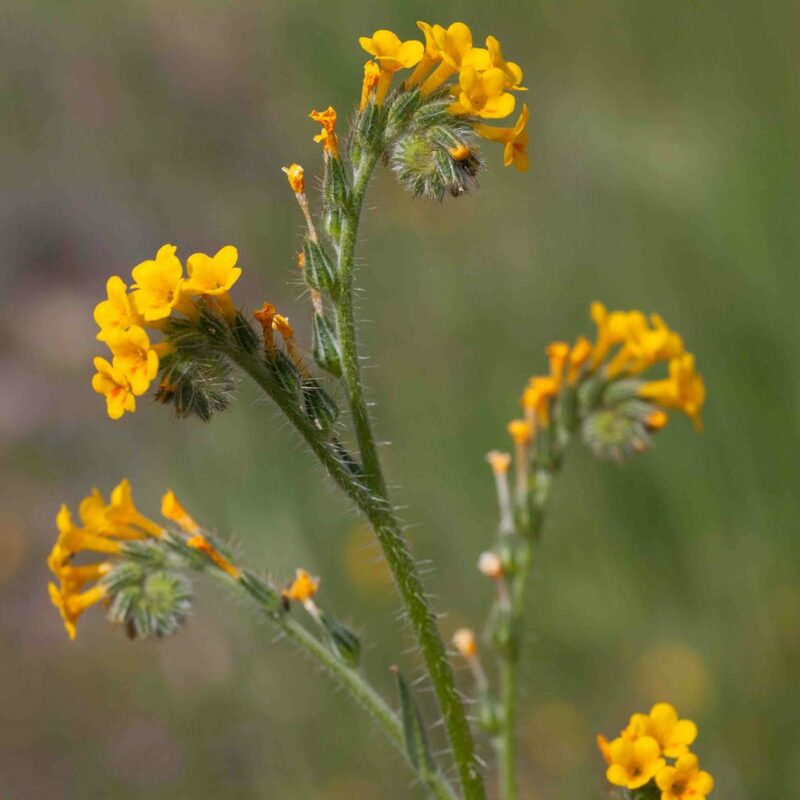 As its common name suggests, this is the most commonly found Fiddleneck, certainly in the Monterey Peninsula where it is often found in great profusion. 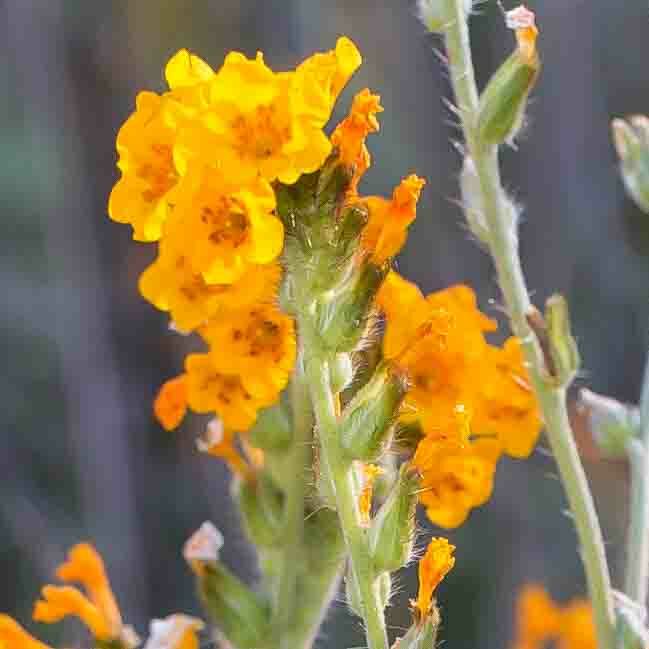 Individual flowers are 7–11 mm long and 4–10 mm across, with a long exserted tube and, generally, with orange spots at the base of the lobes. 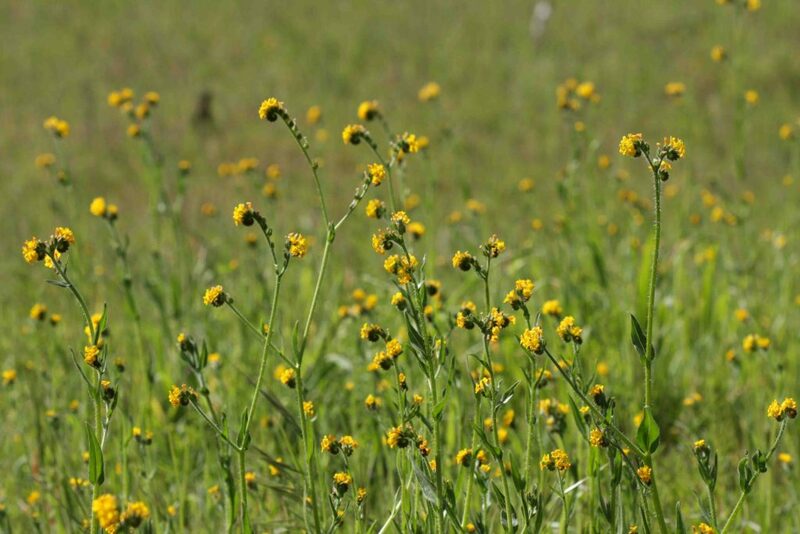 There are 5 narrow calyx lobes, equal in width and fused only at their base. 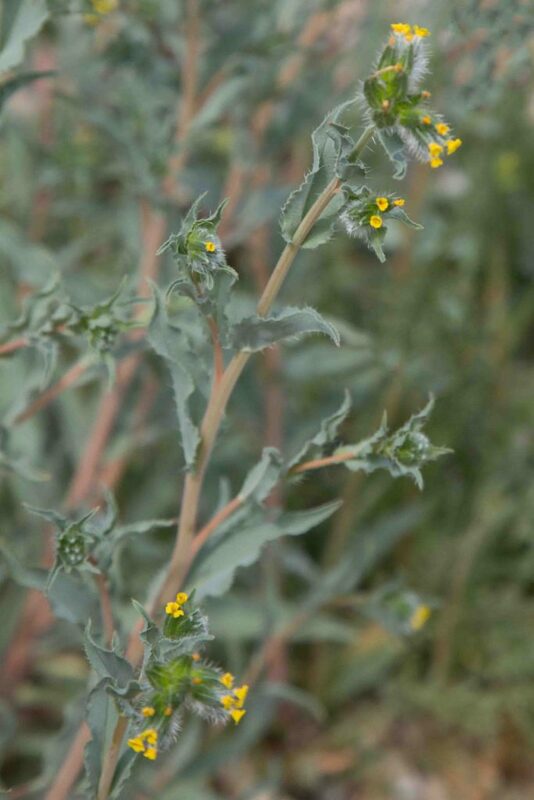 Leaves are wavy-edged and bristly. 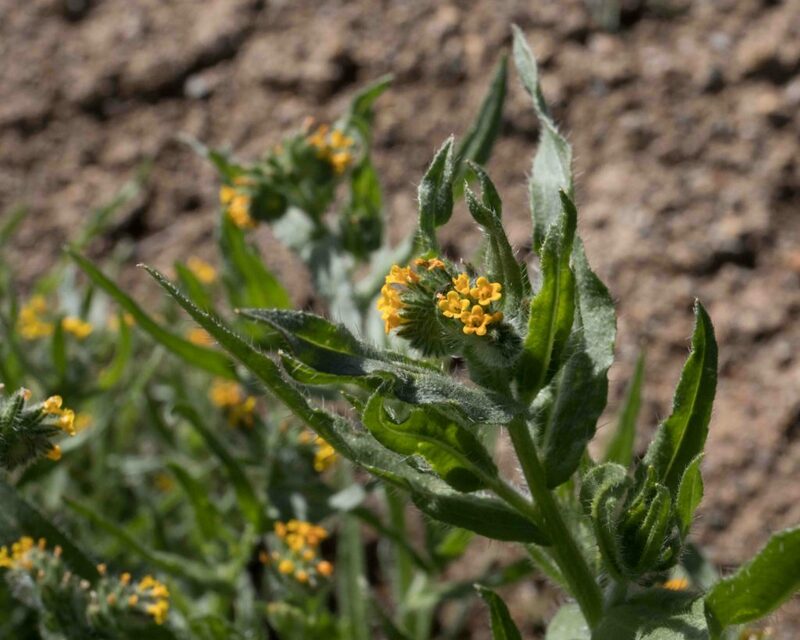 Except for the size of its flowers this is similar to Small-flowered Fiddleneck (Amsinckia menziesii) and Jepson suggests that they might be better regarded as a single species. 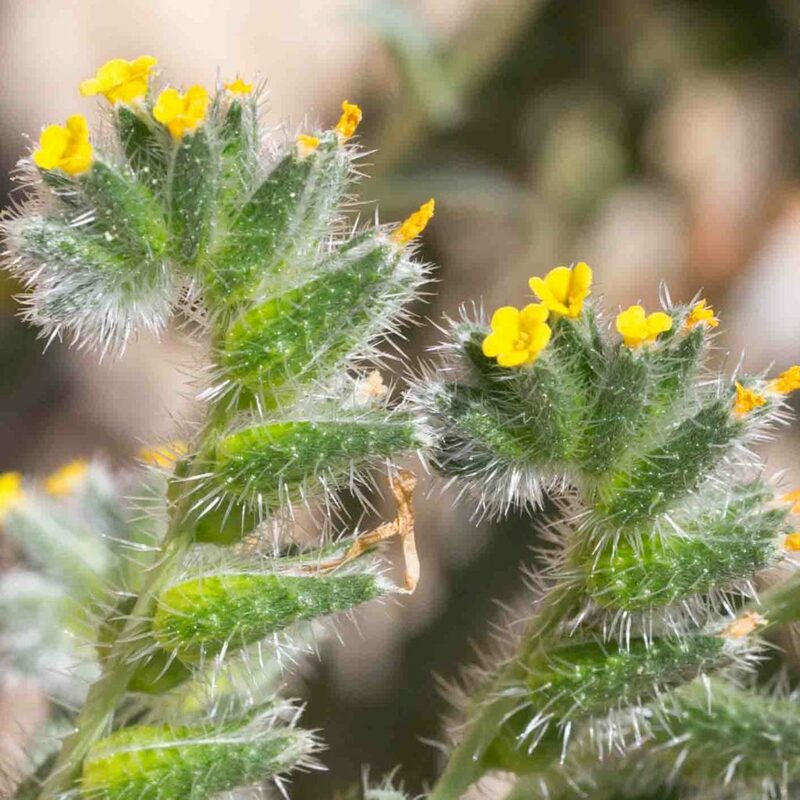 Similar to Common Fiddleneck but with smaller and paler flowers, 4–7 mm long, 1–3 mm across), more or less exserted from the calyx tube. 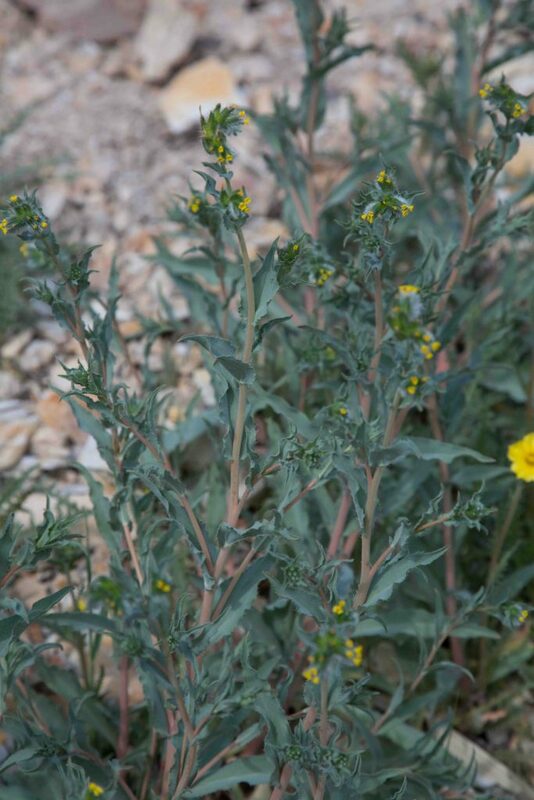 Stems have two kinds of hairs, some short and appressed, others longer and spreading. The finger nail is included for scale, it is exactly 1 cm across at its widest point. 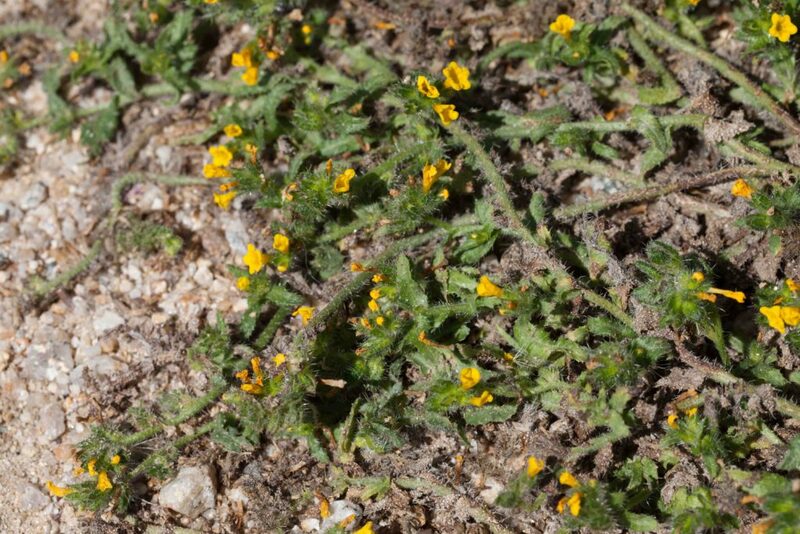 Although immediately recognizable as a fiddleneck, this species has several distinct features. 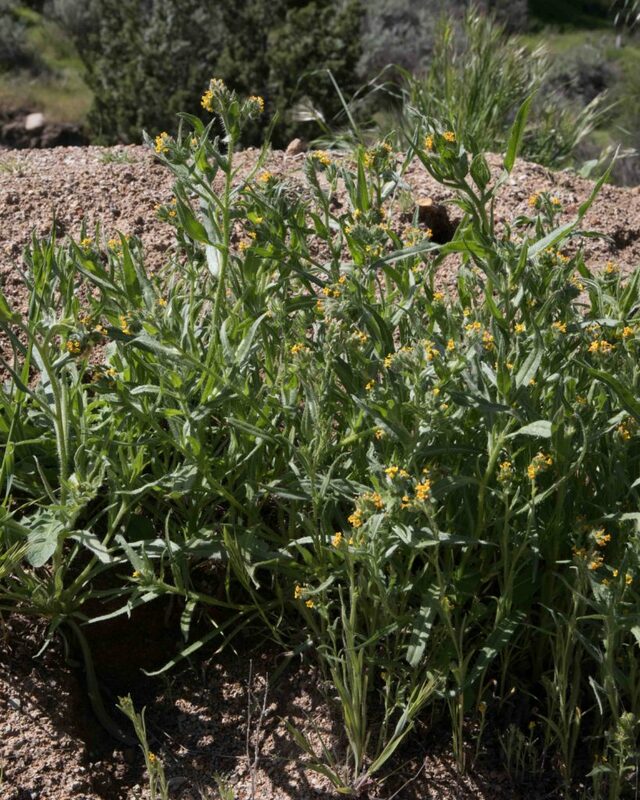 First, the stems are generally (though not always) decumbent and secondly the leaves are more or less succulent, with fine teeth, each ending with bristly hair. 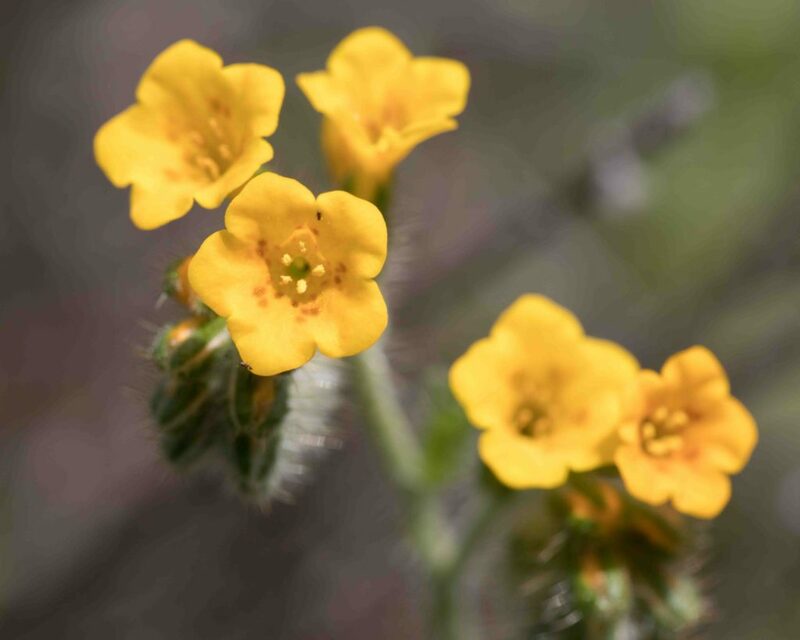 Flowers are 7–15 mm long, 5–12 mm wide with 5 calyx lobes of equal width. 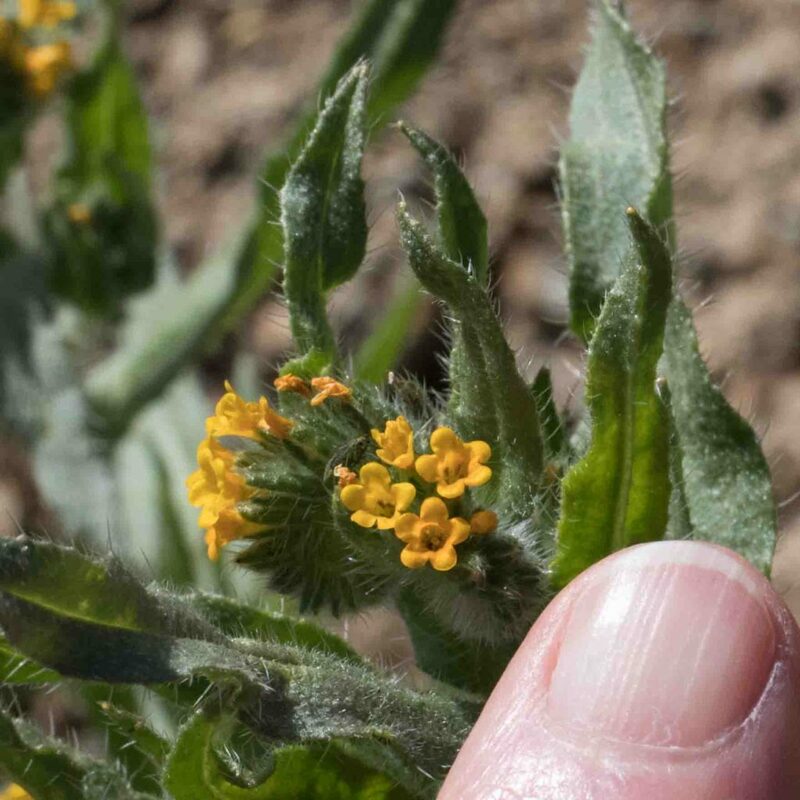 One of a minority of fiddlenecks with 2–4 calyx lobes of unequal width. 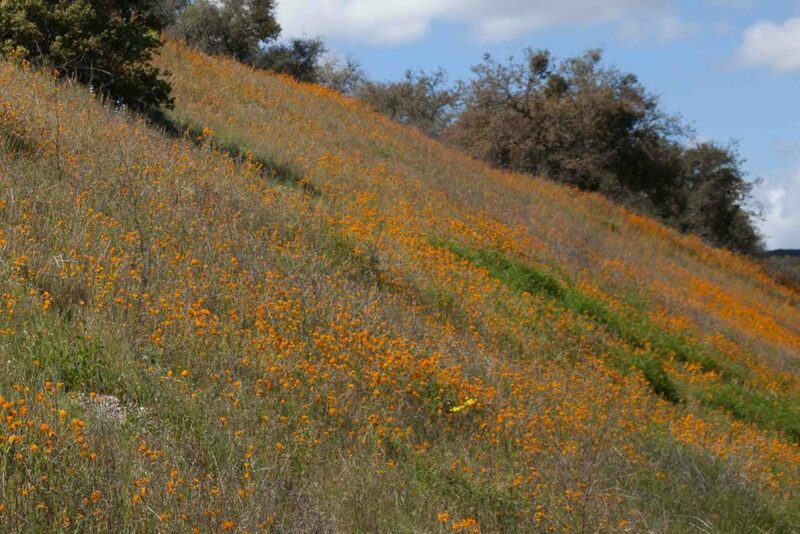 This has comparatively large, bright orange flowers, 14–22 mm long and 10–16 mm across, each lobe with 5 darker spots. 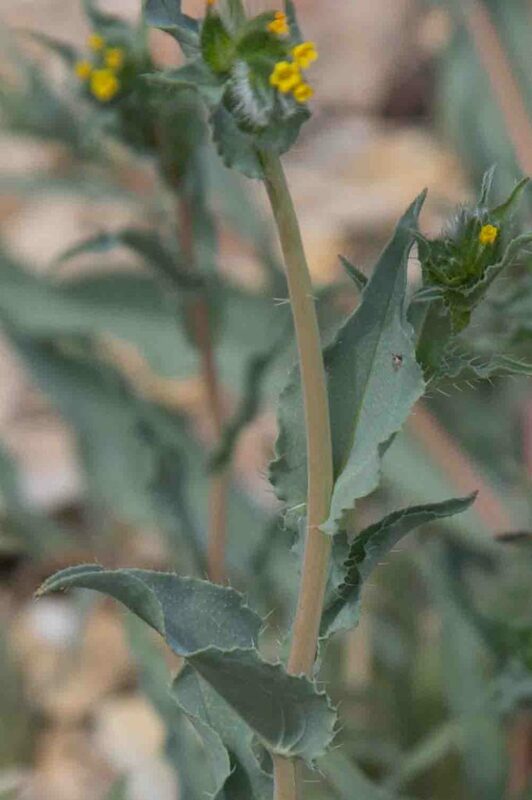 The stem is slender and branched in the upper half. Forms impressive displays along the side of the Jolon/ Bradley road in Hames Valley. 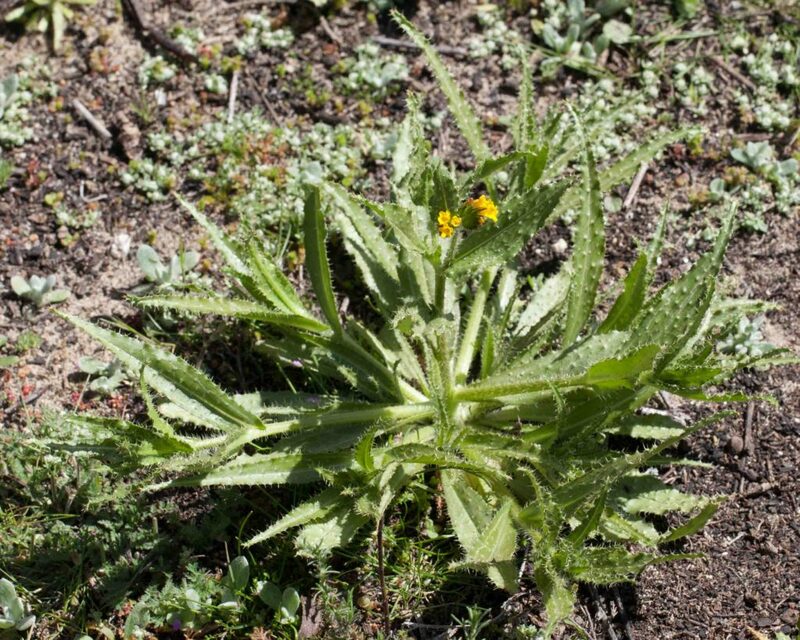 Like Douglas’ Fiddleneck (Amsinckia douglasiana) , this has 2–4 calyx lobes of unequal width and with a distinct notch at the tip. 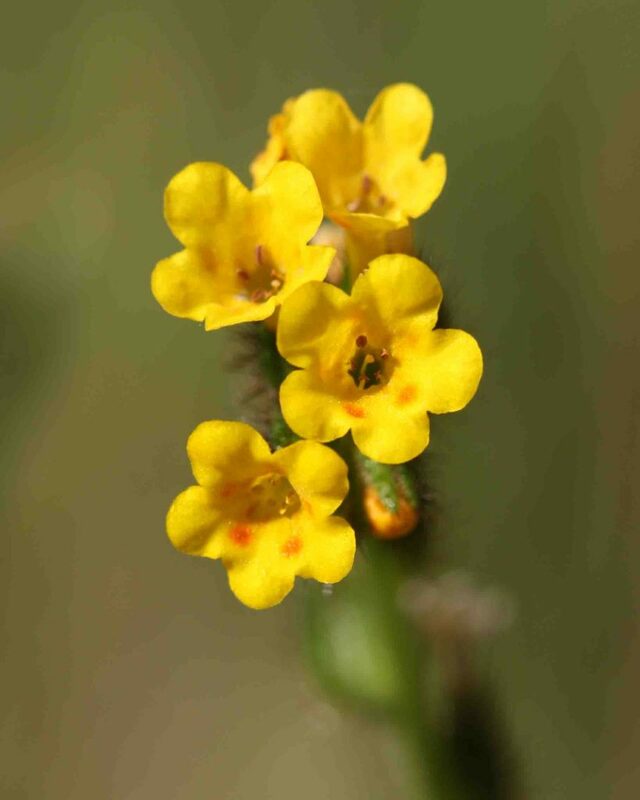 Its flowers are a little smaller (12–16 mm long and 10–16 mm across). 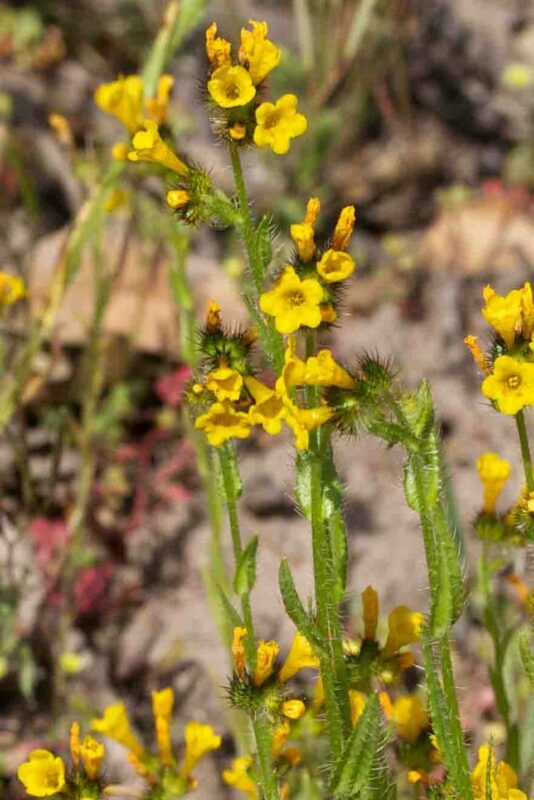 A subtle difference is that the length of the style in this species is constant whereas it varies in Douglas’ Fiddleneck. 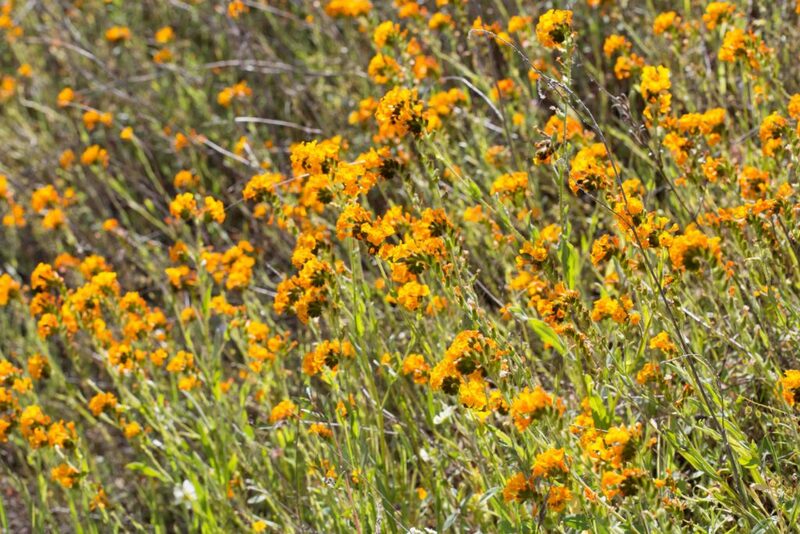 Occasionally found near eastern end of Carmel Valley Road. 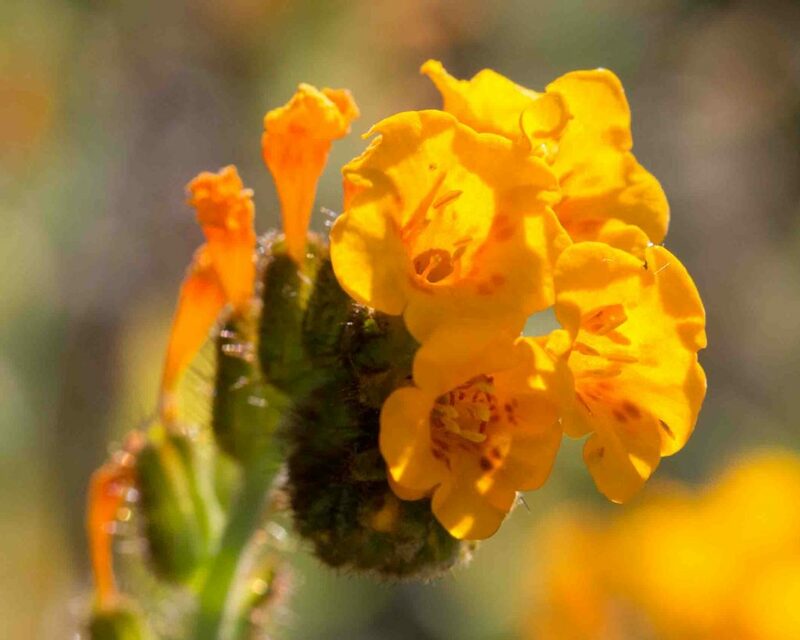 Can form expansive populations in the Carrizo Plains area. 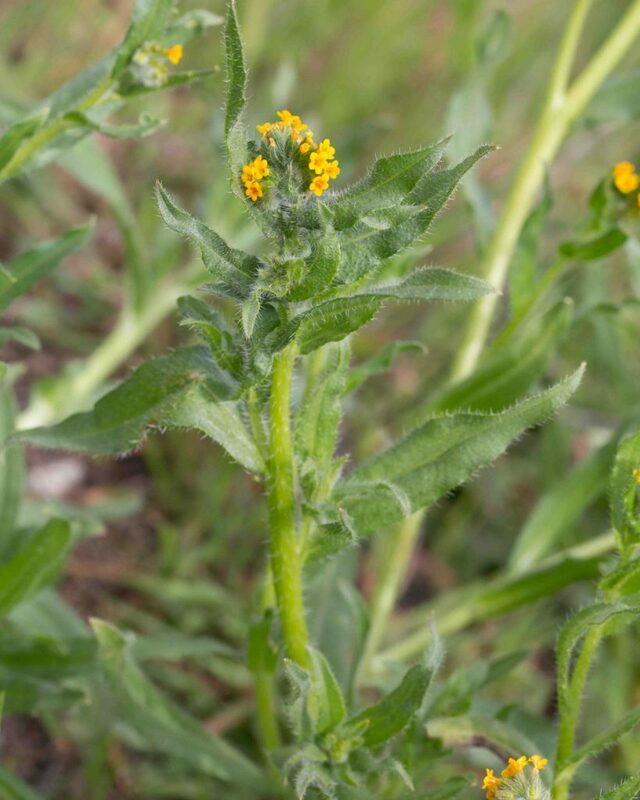 An uncommon fiddleneck, this also has 2–4 calyx lobes of unequal width but is easily distinguished from Carrizo Fiddleneck (Amsinckia tesselata var. 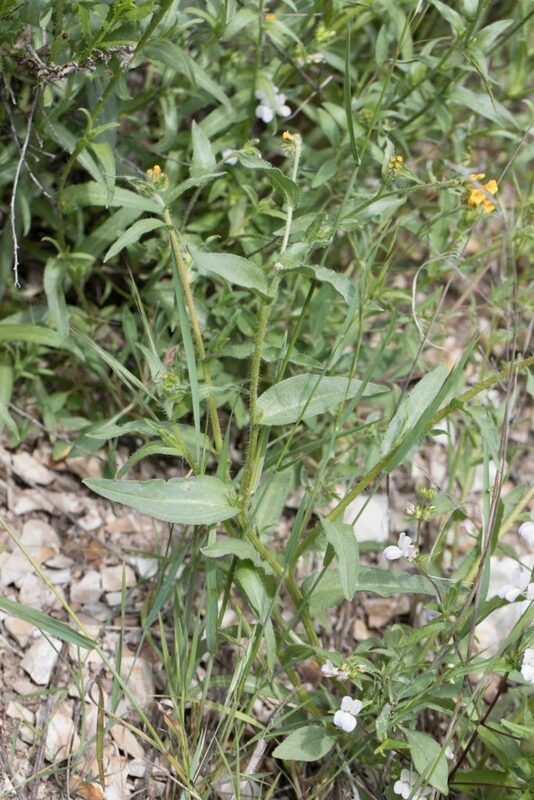 gloriosa), which likes similar conditions, by the smaller size of its flowers (8–12 mm long and 2–6 mm across) and, more prominently by its white to pinkish almost glabrous stem and its glaucous leaves.